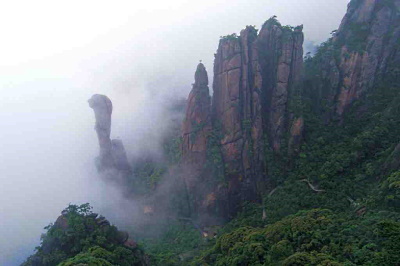 The Mount Sanqingshan National Park holds an outstanding scenery of granite peaks and pillars. The area also has numerous waterfalls, valleys, lakes and springs. The massif is covered with temperate forest, home to rare and endangered plant species. Its visual impact is enhanced by the ocurrence of meteorological effects like bright halos on clouds and white rainbows. Sanqingshan (San Qing Mountain) is made up of three main summits: the Yujing Mountain, Yushui Mountain and Yuhua Mountain. The park is located in Jiangxi Province, southwest of Shanghai. I went to this WHS in the summer of 2102. I have been to most of WHS in China, and Mt Sanqingshan is one of the most beautiful one. It was easy to go form a famous ancient village Wuyuan in Jiangxi province. The mountain's high light is a huge stone which look like a cobra, and the plank road on the cliff is really worth to go. Taoism: It is a holy Taoist mountain.